TWELVE years behind its original completion schedule, the Corrib gas project’s costs have spiralled with €2.68 billion spent by December 2012. Reports in a number of national newspapers confirm that the bill for the project, which has been delayed due to a sustained community based campaign leading to a number of oral hearings and clashes with gardaí, will culminate in a €3.4 billion cost when completed by the end of next year. That is four times the original projected cost. GÁRDA watchdog investigators have interviewed the former Shell contractor who claims his company, OSSL, supplied three loads of booze to Belmullet GárdaStation in 2005, 2006 and 2007, The Mayo News understands. The interview with co-owners Des Kane and Neil Rooney, which was held earlier this month, is part of the ongoing investigation into the allegations that have been rejected by Shell E&P Ireland. Coincidentally, Minister for Justice, Alan Shatter revealed in the Dáil that the cost of policing the Corrib Gas project had now reached €16 million. SHELL E&P Ireland plans to apply to the EPA (Environmental Protection Agency) early in 2014 for a review of its Integrated Pollution Prevention and Control License (IPPC). Last October the High Court quashed the EPA’s decision to grant a license after Erris resident, Martin Harrington, argued the agency had failed to adhere to proper procedure in reaching its decision to issue a revised license. THE modified IPPC license, which addressed issues raised during an EPA oral hearing in 2007, was issued last June. The Corrib Gas partners are now counting the cost of a contentious An Bord Pleanála ruling as the bill for the project is set to hit almost €3.4 billion before the end of next year. The Corrib Gas partners are now counting the cost of a contentious An Bord Pleanala ruling as the bill for the project is set to hit almost €3.4bn before the end of next year. The company driving the project, Shell E&P confirmed yesterday that the Corrib Gas Partners last year spent a further €250m on the project, which has yet to make any commercial returns. The 2012 outlay brought the total spend on the project to €2.68bn at the end of December last. An opponent of the current Corrib gas project has been convicted under the Public Order Act following an anti-Shell protest earlier this year. Terence Conway of Inver, Barnatra, contested the two charges before the court – refusing to comply with the direction of a garda and wilful obstruction. 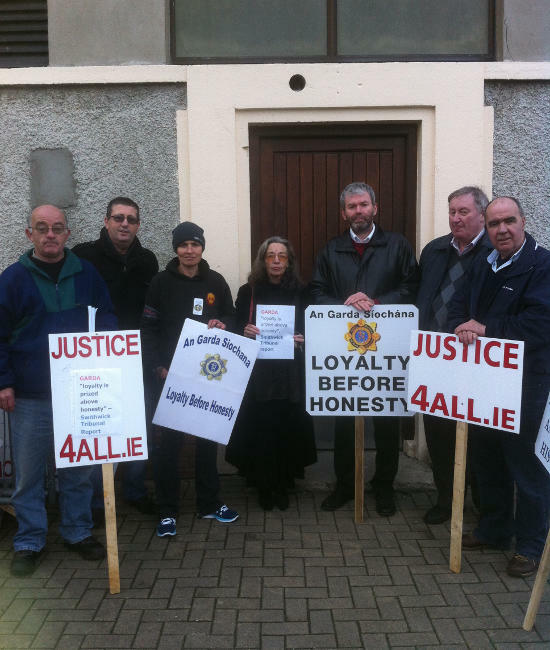 On Wednesday last, Garda Seán McHale told Belmullet District Court that on June 11, 2013, he was made aware of a protest at Aughoose, Pullathomas, close to the entrance to the Rossport Solidarity Camp. Recently appointed Judge Faughnan presided over this month's district court session at Belmullet. Two Shell to Sea related cases were finalised resulting in one campaigner avoiding conviction by receiving the benefit of the probation act and another - local Shell to Sea spokesperson Terence Conway - being convicted and fined E200. When the Belmullet District court session opened on Wednesday morning there were seven campaigners due to appear in court on charges arising from the ongoing imposition of, and protest against, the Shell Corrib gas project in North West Mayo. Shell Santa also made an appearance at court bearing gifts of alcohol but the Gardaí didn't seem too happy for him to visit them in such a public setting. The Corrib natural gas field developer will apply to the Environmental Protection Agency (EPA) for review of its pollution prevention and control licence early in 2014. A group from Shell to Sea - Erris travelled to Limerick on Friday 13th December to attend a Justice 4 All protest outside Henry Street police station. This was a follow-on from the recent Peoples' Forum - "Who Polices the Police? ", which was addressed among others by Mick Wallace TD and Clare Daly TD . John Wilson, one of the two garda whistleblowers, who raised the penalty points scandal addressed the protest and castigated both the Commissioner Martin Callinan and Minister for Justice Alan Shatter saying that the force, as found by the Smithwick tribunal, still places loyalty above honesty . 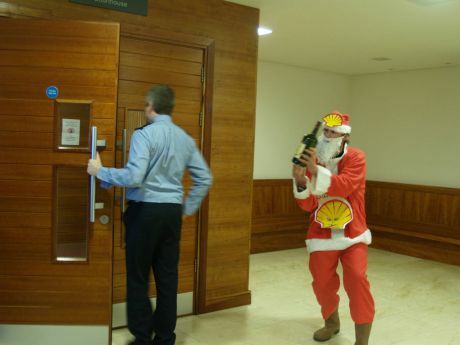 Just before Christmas 2013, Shell Santa visited Belmullet District Court just before the court was due to sit to offer the Gardaí some whiskey. However it seems they prefer if the drink is delivered in private, as the Shell Santa was quickly ushered to somewhere more discreet.